I bought my Garrett AT Pro about 6 weeks ago. I did it because I live right next to a very large beach, and on many occasions, I had seen metal detector people on the beach scooping up the sand and then looking intently at what was in their scoop, then picking it out of the scoop only to look at it again intently, then slip this item in their pocket, only to start detecting again. Of course, I knew what was under the sand, coins, maybe some bracelets, keys, or iPhone... but I never paid much attention until I spoke with a guy that had traveled 100 miles to come to this beach. I walked up to him and asked him if he found anything. 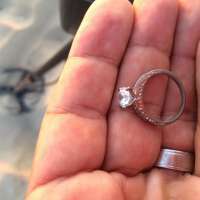 Only now, do I realize how weird, uncomfortable, and sometimes annoying that question is, and for any metal detector in the hunt, it is also taken with caution as you never know if they are going to say, they just lost what you just found. Perhaps this is completely wrong, since I have only been doing this for 6 weeks, but I have had about 50 people ask me if I have found anything, and I have learned my standard answer is, "Yes, mostly bottle caps, and a few coins." This works for most people. It didn't work for me when I asked this kind gentlemen what he found. He was excited, and he said, "You know, people always laugh when they ask me that question, but I don't care, I find about $150 dollars in coins every month, and I have found over 120 rings, most of which my wife has claimed." I had a nice 10-minute conversation which I know was precious detecting time for him. 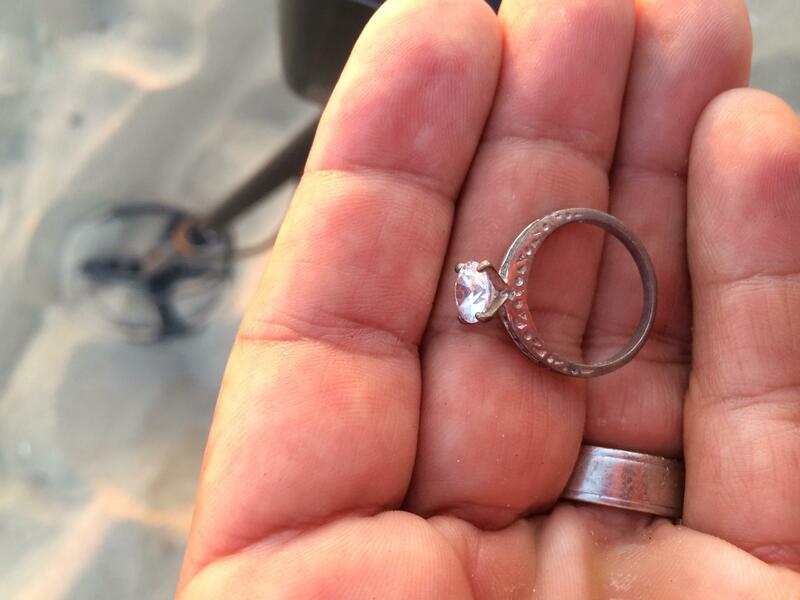 A week later I had a metal detector and I was on the same beach hunting. I found bottle caps, soda tabs, e-cigarettes, coins (quarters, dollars, nickets, dimes, and lots of pennies), aluminum foil, house keys, knives, and lots and lots of little pieces of junk, too numerous to mention. My dream was to find a diamond on a gold ring. I visualized it every day and told my wife that is what I was going to find. After hunting for about a month religiously every morning from 5-730 a.m. I took a couple of days break from the hunt. My wife asked me why I had quit. I said, I haven't quite, I am just taking a break. The reality was that I was getting a little down that I hadn't found the diamond ring that I had visualized. One evening we were headed out to dinner on a very busy road, and we noticed there was an accident on the road and that it might be some time before we moved. My wife looked at me and asked if I wanted to go to the beach, as it looked like going to dinner was on hold for at least an hour. I said, sure, so I made a u-turn and we headed to the beach which was only about 5 minutes away. It was getting dark but I looked at my wife and asked if she would mind if I did some metal detecting while we went walking beach. She said, "No problem," and took off for her walk along the shoreline... I watched her walk away and then turned my attention to the sand where I knew my treasure lay. I found a few bottle cops that always appear like gold and coins on my machine, but they do give off a funny chattering sound, which I have come to recognize, and I was just about to move on but decided that there might be something next to it.. So I stuck my sand scoop in the sand and pulled it out. The sand was somewhat wet and unlike the dry sand which sieves out nicely, you have to shake the wet clumps away.. I looked in my scoop but didn't immediately see anything, then I saw a bottle cap which I pulled out and put in my trash pocket. After all, I don't want to have to find it again. Then I put my scoop down to the sand to get ready to move on again and I heard something metallic in my scoop. There are lots of pebbles in the sand and I thought it might be that, but just to be sure, I lifted the scoop up, shook it to get any other sand out of it and looked in.. The light was low but when I saw it, I knew what it was immediately. When my wife met me back at the car, we both looked at it and were astounded at the simple beauty of it. I realized later that it was timing and persistence. I will never discount persistence on the beach environment again.